Colin Webster (saxophone); Dirk Serries (guitar); Andrew Lisle (drums). 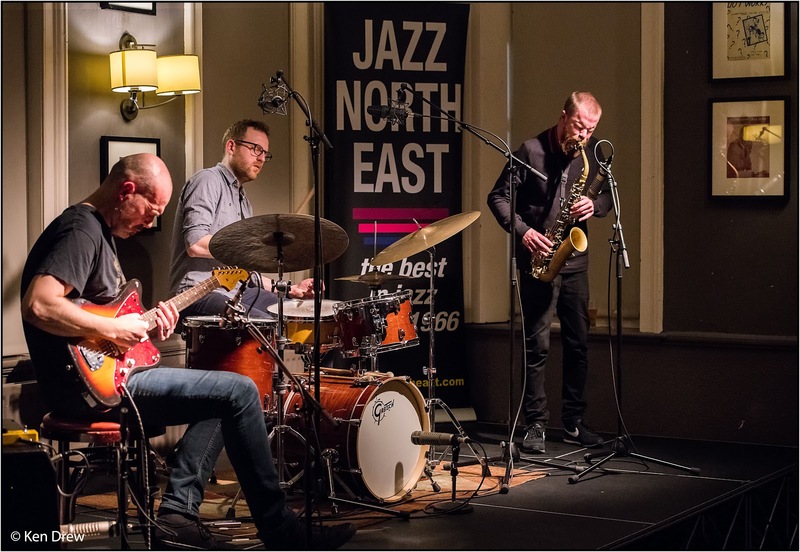 An Easter Sunday treat better than any chocolate egg as the Kodian trio performed two superlative sets of crunching high octane improvised jazz. Colin Webster on alto played with tremendous verve and energy, Dirk Serries played guitar in as unique a manner as I have ever seen. It was no surprise to find out that the Belgian is a veteran of the industrial-ambient music scene. Much of time Serries played with the guitar horizontally on his lap as he plucked, strummed, bowed and picked the string with a variety of objects. The sounds and rhythms he was able to extract were quite mesmerising. Andrew Lisle on drums somehow managed to glue the contrasting styles of the guitar and sax so that the trio performed as a tight single entity. Most of the music seemed to be played at 100mph before the band really cranked it up. However, there were some more gentle reflective passages of play too but all in all it was as an exhilarating and exciting performance that anyone could wish for. Only an April fool would have missed it.